The capers are picked by hand on the windy hills of Salina (Eolian Islands). In a complicated and labourious procedure they are cured in sea salt for about 20 days to extract bitterness and to âripenâ the capers for culinary use. Conserved and packed in sea salt they maintain their very own tipically mediterranean âcaperyâ taste. Rinse capers well under running water and drain. Pat dry with kitchen paper. Add to salads, to tomato sauce, to stews, fish soups and grilled fish and they will enrich any dish with their very mediterranean bouquet. 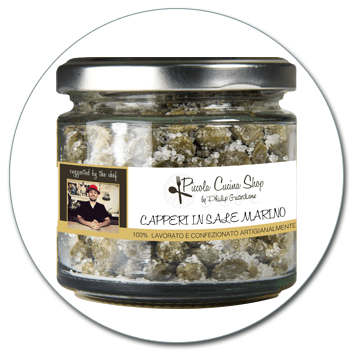 As Fingerfood just stir fry the rinsed and dried capers in olive oil until crisp and slightly browned. Drain, cool, pick on toothpicks and buon appetito!